The power to become successful lies in you. 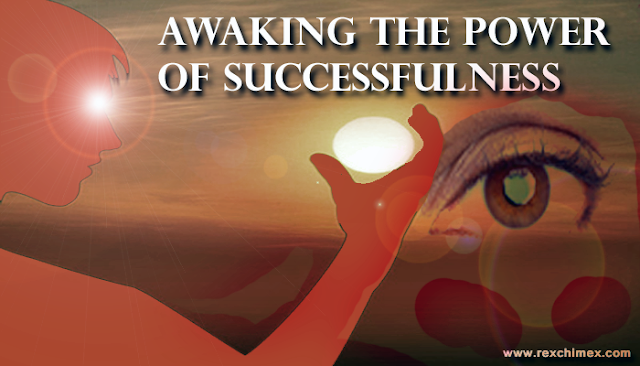 It is within you, but you have to believe and do certain things to awaken the power of success. Else, the power to become successful remains asleep within you. Who said you could not do it? What denies you the power of self-confidence, and constantly expose you to fear? All these abnormalities show that the power to become successful must be awakened and harnessed. The points below can help awaken the power of success in you. Yes, you can and you will. 1. The inevitability of Change. Change is inevitable. No matter what happens one should never change one's mindset of achieving success. Not every bad situation should ever stop you; rather you should take advantage of it and try to solve the problem. Complaining has never solved problems, rather it left problems untouched, with more guts. Embracing change or a new development entails becoming stronger and more experienced. If Joseph had remained with his brothers in his father’s house, he would never have become the governor of Egypt. By facing a challenge squarely, you would be creating a solution not for yourself alone, but also for the people that might be in the same situation with you. You become a reference point. The death of one's parents or guardian should never discourage one from planning and acting on becoming successful. Even when it involves them 90%. Be resolute, be formidable. 2. Everyone must not Like or Want you. Realize that you do not need everybody to like you so as to become somebody because if everyone likes you, that is a problem on its own. No one will tell you when you go astray and no one will make you vigilant because you have been made to believe that they all like you. Falsehood! An enemy is someone who reduces you to success. If they throw stones at you, turn the stones to stepping stones or milestones. If no one talks about you, then you are nobody. Both the sane and insane have something very different to say about an individual. Trying to please everyone and displease yourself… Might be an unwise step to take. Most of the people you are trying to please barely think about you. Do not expect everyone to like you and your plans, always work according to your set out plans, which will help you to achieve your goal. People will only notice and like you when you have made it in life. No one identifies with a loser, except losers. 3. Have a Plan and be Focused. The path to Success is simplified when you have a plan. If one does not have a plan, then he/she has to fail. You do not sit all day in your home and expect to become a force to reckon with. Move out there and do EXPLOITS! Whatever you see today around you, was already planned by a creative mind. Before it becomes a reality and success. The electricity and electronics we enjoy today are the results of the sacrifices of great men. What have you to offer? Be creative! Plans are the virtual steps one creates and climbs on, to achieve success. Beware the kind of people you tell your plans because they might talk you down or add to the available obstacles in your way. Move with people who truly support your vision and stay away from negative minds that poisons and corrupt everything they meet. Some will tell you ... bro you cannot do this, the economy is just too hard, just follow others, and do what they are doing. Can you not see the population, who do you, think you are? Do you think they will hear you? Why stress yourself? Leave the main road (proper route) and follow the bush (shortcuts). The sun is too bright, let us wait for the moon; the moon is too dark, let us wait for the sun. The above statements are the utterances of men who are biased and confused. They keep procrastinating and waiting for the right time. It is better you do it now because the right and perfect time may never come. Moreover, people who keep waiting for the right time, rarely gets anything done. Move out of the Comfort Zone! Also, do your best to make special use of your ideas, immediately it comes. Do things the proper way, and avoid unnecessary shortcuts, for it has killed many people. If you plan and execute it, they will call you "The BLESSED". Yearly, manufacturers update the content of their previous product. Have you ever asked yourself why? If you are out of date as regards to knowledge and information, how then can you use updated products? You cannot! Once you stop reading and seeking knowledge, you start dying. Because you add no value to yourself and the entire society. Knowledge should be sought by both the young and old, from cradle to the grave. It is essential! Read books that have a positive impact in your life. So that you will be motivated to carry on, no matter what happens, and your dreams and ambitions will happen. If you do not update your knowledge, you will be outdated. Just like, you cannot fight someone who has weapons of the 21st century, with weapons of the 19th century. Read about those that have already become what you wish to become. Know their source, plan, and the steps they took to became what they are. Always be up-to-date. 5. Work Smart and Work Hard. Most people work so hard. Perhaps they would have been the richest men and women on earth, but unfortunately, they never worked smart because they were outdated. Some uneducated and unenlightened farmers use crude tools but most educated and enlightened farmers use advanced machines and techniques in agriculture. In addition, we all know who would have the big harvest and sales, the educated and enlightened farmer of course. People perish because of lack of knowledge. Something that would not take long to solve, turns out to become a monstrous problem because of bad approach and decisions. One should learn not only to work hard but also to work Smart, by acquiring knowledge that can facilitate and compensate hard work. Young man, young lady, old man, old woman. An unexamined life is not worth living at all. When one lives without purpose, without achievements then such a life was lived without examination. Always take your time to sit down and reflect on your life so far. What are the things I did wrong in the past and what are the ones I got right. How do I improve my life, so that the past does not haunt the present? Seek help, seek advice, and insist on making your life worthwhile. Your past remains history but your present is a mystery. Therefore, do not live a life that lacks a good legacy. Your plan or goal must be SMART. You must be inspired within yourself to achieve a goal. Even if you read every motivational book on earth and lack self-inspiration, which is driven by decision, self-discipline, and determination. Nothing can be achieved. Your goal must make a difference, however great or little it may be. Even as small as the mosquito is, everyone who sleeps with it, testifies of its greatness in the morning. Your goal must be feasible and realistic. It must look achievable when you look at it from your perspective, not from the perspective of others. Your goal must have the quality of being replicated. Else, it dies with you and cannot be modified or made available for the benefit of others in your absence. Your goal must have a time limit. If not, then your goal may not be achieved. You will never gain recognition in what you started but rather in what you have finished because the end justifies the means. How you started does not matter, but how you finished and the result output is all that matters. Never give up in what you have started, stay in tone, and finish it to achieve success, and be recognized. The owner of an uncompleted building is never counted among those that have a house. Always strive to finish what you have started. Only cowards give up. Failure does not mean that you have failed; it only means that you need to reshuffle the way you did it before and restarted in a super way. 8. Do not forget or exclude God. In all you do, acknowledge God. For He will direct your path and make men favour you. After making your plans, call upon him and present your plans to him. He can give you more tips on your plan. Do not underestimate or neglect God! No man who walked with God ends up in regret. So stand with God and you are automatically standing as a formidable being on the surface of the earth.